Hey, I'm Coach Eric and I work with athletes (especially off-road Xterra triathletes) who struggle to find the time to coach themselves. I help them reduce stress, have FUN, and give them the tools to get exactly what they want, getting to that finish line as fast as possible! I will help you navigate the difficulty of training. I meet with you and analyze your dreams and goals. I give you a custom training plan. If you like I can be there the whole way and we can execute it together. 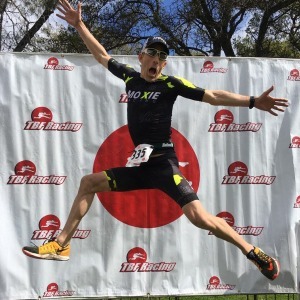 I've been racing triathlons since 2006 and competed in the Ironman World Championships in Kona, 70.3 World Championships, and the 2018 Xterra Off-Road Triathlon World Championships in Maui. I was the 2018 Xterra Regional Champion, and I also have a marathon personal best of 2:36 and finished the Boston Marathon. And when I'm not swimming, biking or running I can be found hanging out with my 15 year old rescue dog Guinness or traveling (Greece, Thailand, Portugal and Banff are just a few of my favorite places)! If you're dying to know more, three things you don't know about me are - I ran 20 miles on a track while I was in Spain because I didn't want to get lost. I have broken both of my collarbones, and I have a doctorate degree in clinical psychology specializing in working with injured athletes (especially concussions). Work with me right this second by CLICKING the Contact tab for a free 15 minute consultation with me.